Seam allowance -- that little area between the sewing line and the cutting line. For some reason that little quarter-inch to one-inch area has been a huge point of indecision for me. As I mentioned in my earlier general post on The Sweater Knit Fabric, the expert information that I've come across has ranged from 3/8 of an inch to a full inch when it comes to seam allowances for this type of fabric! But I've been practicing and experimenting and practicing some more and I've settled on a basic seam allowance of 1/2 inch. How did I finally come to my decision? I admit to preferring paper patterns without marked seam allowances so that any adjustments can be made without the seam allowances getting in the way. It follows that I'd draft and print my paper pattern without seam allowances. After reading this article and this one on Fashion Incubator, understanding that I was not making garments for production, and still being needlessly nervous about frays and runs, I decided to go with the 1/2 inch. (For the record, with proper fabric prepping and power cutting, I haven't had any problems with frayed edges and runs.) And that was that. The next step was adding the seam allowance before cutting. A Google search for "adding seam allowance to pattern" will bring up various methods. This is the unique way I added mine. Yep, I removed that blue perpendicular indicator thing from my Dritz sewing gauge ruler. I just squeezed the blue plastic piece (with its hidden metal spring) out of its slot on the ruler. I then pushed the piece onto the upper blade of my Black & Decker Cordless Power Scissors . It's exactly 1/2 inch from the cutting edge of the blade to either point of the blue winged indicator. I kept the point aligned with the edge of the paper pattern as I cut. Easy. Caution: These rulers come in different sizes and the perpendicular indicators come in various colors, which may mean that the sizes of these indicators vary. 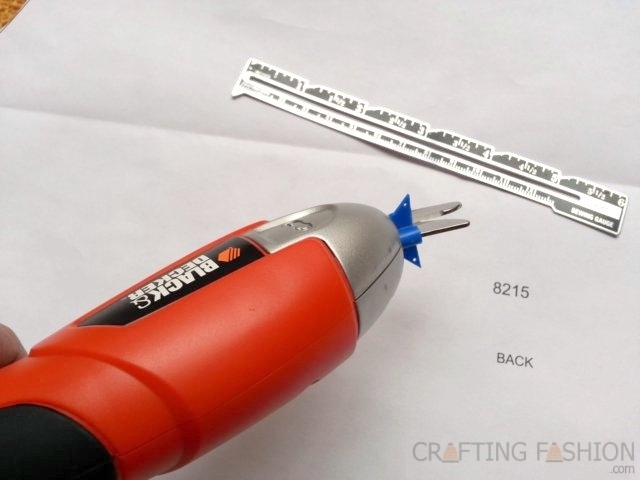 If you decide to use this method, be sure to measure yours from between the blades to the end point of the indicator. Using 4 threads, my serger is set (out of the box) to create a seam that's one-quarter of an inch wide. This means that if I have a half-inch seam allowance, I must trim away the remaining quarter inch (1/2 - 1/4 = 1/4) as I stitch. Horrors! I don't like trimming away that much of my beautiful fabric, especially when the edges are so neat and clean. So despite all my hand wringing and semi-clever ideas, I may go another way next time. I'll let you know. In the meantime, I would love to hear how you handle seam allowances in this type of situation and others. A further note on the volatile Power Scissors market: The price fluctuates wildly. I paid $21 this summer (2012). I've seen them as high as $98 online. Buyer beware. While what I do doesn't include seam allowances, I CAN relate to agonizing over creative choices! I love the way your approach is laid out in a clear, concise way & I'm sure many will/do find it helpful. Great work! Hahaha that's clever-good on you! I use a clover adjustable double tracing wheel and carbon paper to 'trace' my patterns. So the seam allowances are auto-magic. I love the double adjustable tracing wheel! Only problem is that I haven't been able to find a tracing/carbon paper that works well with this texture of sweater knit fabric.